Have you heard of Awemama yet? They are a new babywearing subscription program that I am extremely excited about! They just launched and I had the privilege of trying the service out in advanced. I was asked about what carrier type I preferred, what size I like, the fabric, allergy information, and a few more questions. After that, Awemama handpicked a carrier to send me. I did not know in advanced what was being sent so I watched tracking like a hawk. When it arrived, I immediately opened it and WOW WOW WOW inside was a new wrap from one of my favorite babywearing companies! Bijou Wear Plaidass Bravo!! Bravo is an Awemama exclusive and to my surprise, I was sent my base size–9!! For $29.95 per month, you get to try out a carrier for up to 28 days and you can either buy the carrier (minus the initial $29.95 since that was already paid) or send it back to try another. This is such a convenient way to try all the carriers! When you buy a wrap from a retailer and it isn’t love, you usually cannot return it. This is an excellent alternative! The carrier comes washed and ready for wear. Awemama also keeps up on carrier maintenance so you don’t have to worry about that either. Bijou Wear Plaidass Bravo is such a stellar wrap! It is a double weave 100% cotton wrap in a gorgeous merlot and gray. This was a really comfortable wrap with Minerva (20 lbs) AND Maxine (~40 lbs) so that was a plus. I comfortably did a single layer carry with Max which really blew me away. Bravo also helped my double hammock be rock solid with Minerva. This wrap great for heavy babies and toddlers. Thank you so much Awemama for letting me be a part of your launch!! You all are going to go far!! Be sure to follow Awemama on Facebook and Instagram! Also, join their Facebook group. 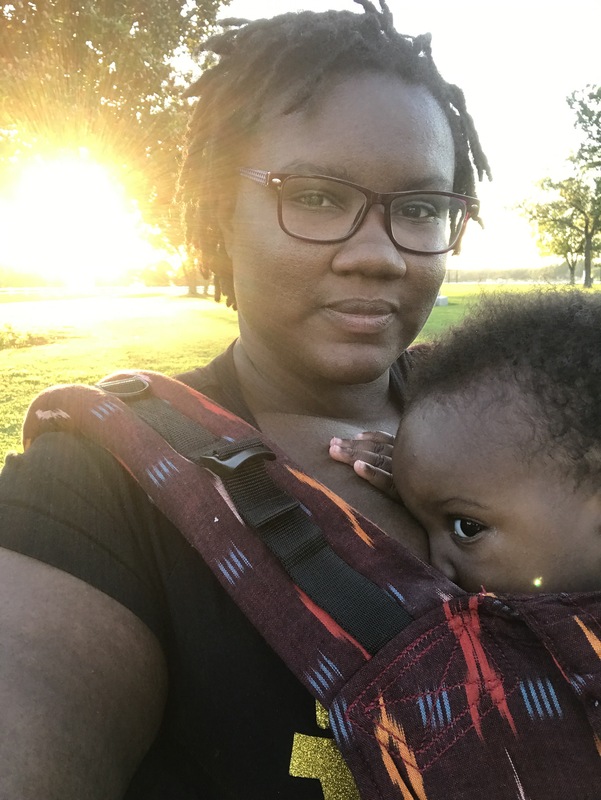 Have you heard of Ethos Babywearing ? They’ve been around for a couple of years and have some innovative blends for their wraps! They also have a pretty cool convertible soft structured carrier. Today, I’m going to tell you about my time with this beauty–Toile Bleu. When I first grabbed this budget BreatheBlend wrap out of the bag, I was shocked by how thin but dense it felt! It is a whopping 325 GSM. Toile Bleu needed some work and I was up to the challenge! Maxine (~40 lbs) and Minerva (~20lbs) both had plenty of time up in this beauty. This wrap breathes so well and I really enjoyed it on our humid days especially. It was very grippy which helped me keep my seat popping queen (Minerva) in place once I tied off a carry. This wrap was in my base size, so I got to try all my favorite base carries! I double hammocked almost every day that this wrap visited. Toile Bleu is ideal for me with double hammock because though it was super grippy, the passes moved easily for me and stuck in place once I moved onto the next step. I also enjoyed this with front wrap cross carry with the passes spread. I rarely do FWCC with spread passes, but this wrap made it a need for me! This wrap had some amazing shoulder pleats as well. It was flat and comfortable on my shoulders. I recommend this wrap to more experienced wearers and also to those with heavy kiddos! Also, if you love grip you will LOVE Ethos Toile Bleu! This budget wrap is $145 for a size 9 which is great compared to size 9’s elsewhere. Be sure to check out Ethos on Facebook and Instagram. Also, check out their Facebook group, Wear Ethos! Extra special THANK YOU to Ethos for your generous donation of this wrap to the Babywearing International of Hampton Roads lending library! Thank you, thank you, thank you! 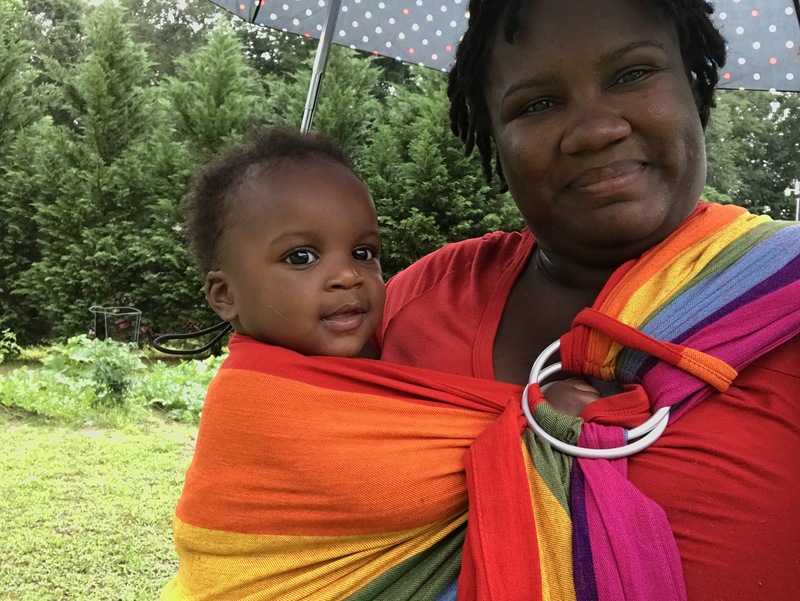 I got to try out a Wildbird ring sling recently while I was teaching at a babywearing meeting. I was super excited when the meeting attendee brought it over because I was dying to try it out since I heard that our group added it to our library. Usually when teaching in person, I thread the ring sling on so that I can make sure that it does not twist on my back. When I attempted to thread the Wildbird sling, I could not get it back through the rings because there was not enough fabric. Without skipping a beat, I took off the sling and put it on the meeting attendee to get her situated. What I wanted to do was cry. I was panicking on the inside. I felt so angry and embarrassed that yet again, a ring sling did not fit me. Later, I checked the Wildbird website and found that the slings are only 74-77 inches long. That is about a size small/medium. I am a fat* woman with broad shoulders. My sling size is an extra large (XL). I can work with a long large. I prefer to use a 2XL. Short one size slings are not inclusive to the wide range of babywearers in the community. I did write to Wildbird on their Facebook page and they stated “Hey Brittany! So glad you wrote us, we actually have longer slings in the works. Watch for news soon!” Soon. They do not currently have any longer slings in stock. In their chatter group, the owner expanded on this statement and blamed growing pains on their inability to make longer slings right away. When asked what length the longer slings would be (after suggestions as well) Wildbird only stated that they would give everyone details soon. Once again, fat babywearers are an afterthought. Really, I should have known that their slings would not fit me. Their social media and marketing are filled with thin people wearing their slings. I am sure that some fat wearers can wear Wildbird slings since not everyone is the same shape, but myself and several other wearers cannot. I truly hope that they do make good on their statement. There are several companies that do offer long or sized slings. Sleeping Baby Productions, True North Ring Slings, Soul, and Maya Wrap are just a few of the many companies that offer long slings. *Fat is the term I use to describe myself because I am fat. I describe fat people as fat. It is not a dirty word. If you are uncomfortable with that, I don’t know what to tell you.